Permanent Secretary Leslie Evans was asked to review the case of DeeAnn Fitzpatrick. Scotland's top civil servant has said an incident where a Marine Scotland employee was pictured taped to a chair was "completely unacceptable, whatever the circumstances". Ms Fitzpatrick claimed she experienced bullying and harassment between 2015 and 2017 while employed as a fisheries officer at Marine Scotland's Scrabster office in the Highlands. Ms Evans said action was underway at the government agency to make sure the working environment met the required standards of behaviour. 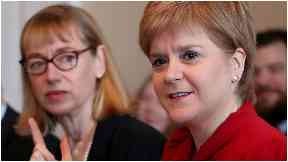 She said in a statement on Thursday: "Earlier this year I was asked by the First Minister to carry out a full review into the circumstances surrounding an image of a Marine Scotland employee taped to a chair. "I am clear that this was completely unacceptable, whatever the circumstances. "A comprehensive internal review has now concluded. The Scottish Government has robust disciplinary procedures to address behaviour that falls below expected standards and I am satisfied that these have been followed thoroughly and objectively in relation to this incident. "A broad set of actions are underway in Marine Scotland to ensure a working environment which meets both the Civil Service Code and Scottish Government Standards of Behaviour."